You may think of Acculevel as just a foundation and waterproofing company, but it is so much more than that. Acculevel is a company built on family values, that has been operating for over 20 years. Situated on the outskirts of the small town of Rossville Indiana, Acculevel brings that small town familiarity to its customers giving them the service they need with individuals they can trust. We pride ourselves on giving the customer no pressure options. The word family isn’t something we just throw around, it means something at Acculevel. We aren’t just a family company but owned and operated by the same family that started it all. 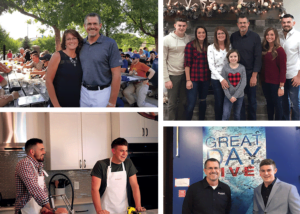 Andy Beery (Founder and CEO of Acculevel), with the help of his two sons, Nolan Beery (Sales and Marketing Director) and Neil Beery (Director of Operations), are committed to ensuring that Acculevel will continue to be family owned and operated. Unlike many of our competitors, we do not belong to any kind of dealer network. This allows us to continue to connect with all of our customers on a personal level, as opposed to being constrained by corporate culture. At Acculevel we value our customers, and it is our customer’s trust in our diagnosis and installation that is the backbone of our success. We will explain to you — the customer — what repairs are needed and what can wait, and we will always strive to provide the best service available for reasonable pricing. As a family, we are dedicated to looking after our neighbors. Here at Acculevel we carry the motto of “Unify + Evolve”, meaning that we will continuously strive to bring our community together and adapt the best processes and technologies to give you the attention and quality care you deserve. When you become an Acculevel customer, we promise to come together and help build a better foundation for you and your family. Acculevel has completed thousands of projects for homeowners just like you. Give us a call and become a part of the Acculevel family today, we will treat you right.